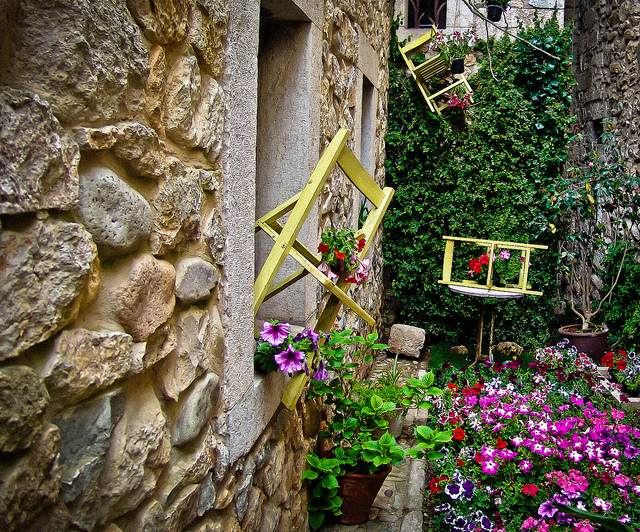 Every year, in May, Girona celebrates Spring with Temps de Flors, the floral festival decorating the Barri Vell – the historical city – with striking colors and beautiful shapes. 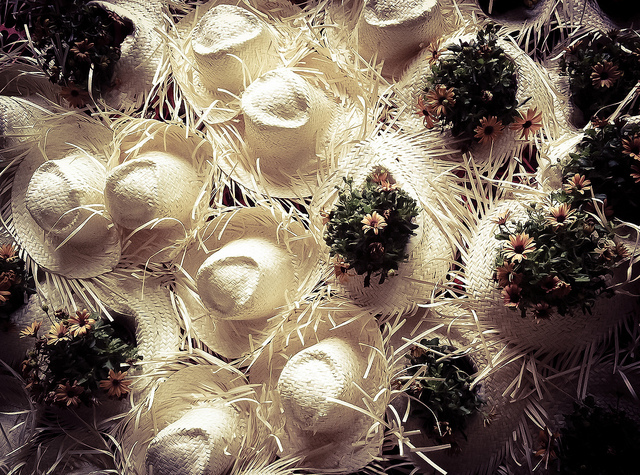 What makes the Temps de Flors Festival so special? 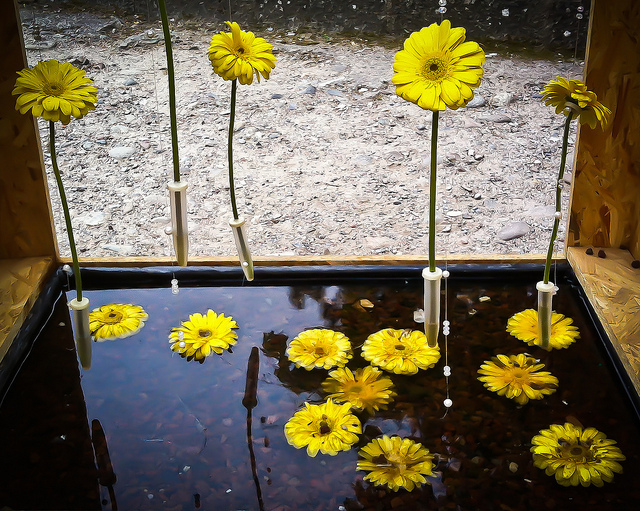 Launched 57 years ago as a small flower exhibition and competition, Temps de Flors has grown over the years and now attracts visitors from all over the world. The Festival is a hymn to color, joy and creativity, a wonderful celebration of a beautiful city and one of the many gems in Costa Brava. There are flowers everywhere. Decorating the walls of historical buildings, into lovely ancient courtyards, along the streets and even in small cozy private gardens. Besides a few more traditional compositions, strolling along the cobblestone streets, watching into the patios is like having a walk in the world of imagination. I was stricken by the exquisite taste of the compositions, awesome in their simplicity, perfectly blending with the surrounding space, enhancing the beauty of the city and its medieval architecture. The entire city participates to the festival with a floral touch. The windows of apparel shops showcased everything having a floral theme, some bars offered flower cocktails, every shopkeeper contributed with a little touch. Looking up while walking along the cobblestone streets close to the Cathedral, original installations create a roof of artificial flowers made up of different materials, offering a lovely effect. 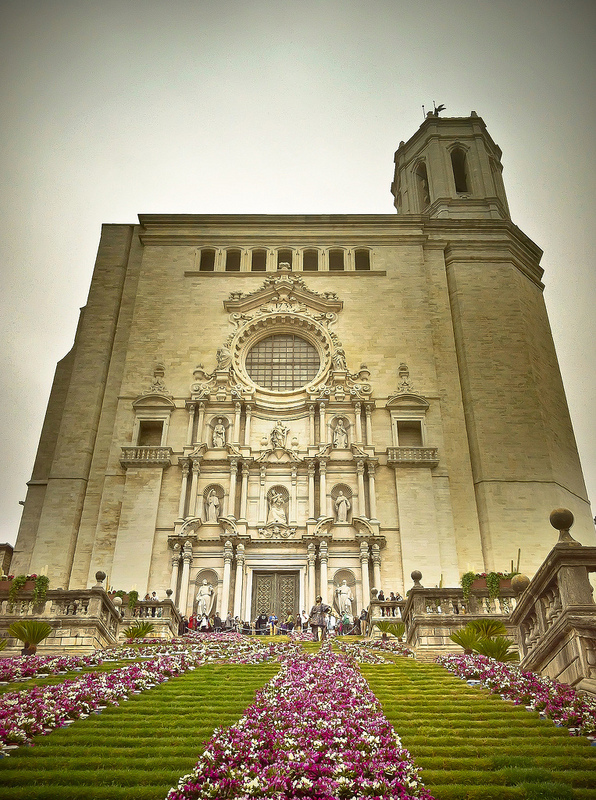 The climax of Temps de Flores is at the Cathedral, where a cascade of fucsia and white flowers between a brilliant green carpet adorned the 86 steps in front of the façade. 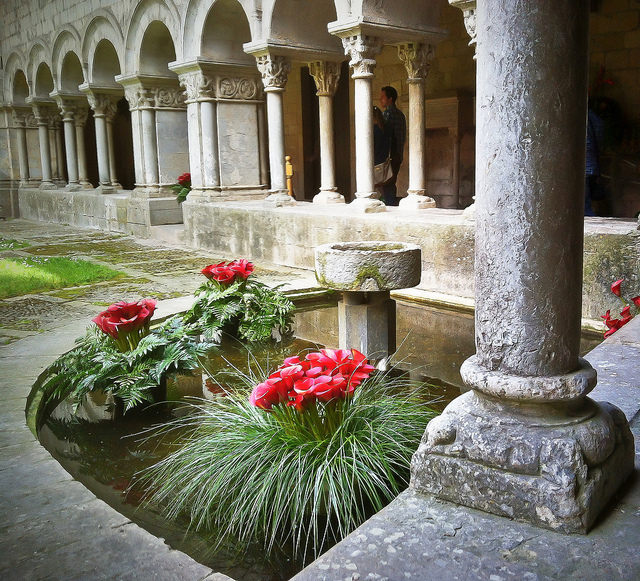 In the wonderful medieval cloister, simple floral arrangements underline the elegant columns, with their beautifully carved capitals. 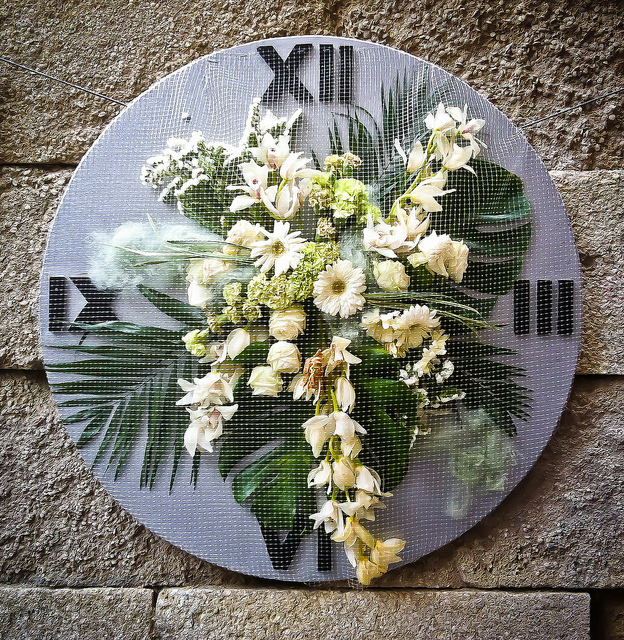 Creativity has no limits at Girona flower festival, as in this lovely decorated clock. And while I stroll around this awesome medieval city, I think that time flies too quickly. Girona… I’ll be back! Girona is easily reached by train from Barcelona. There are frequent rides and the journey last about 90 minutes. Alternatively, Girona-Costa Brava airport connects many European cities through low-cost carriers. The only downside of Temps de Flor is that being such a fabulous event, it has become very popular, thus the narrow streets and the courtyards are often overcrowded. If you have the chance, better avoid the weekend and visit the Festival the first days, when the flowers are fresher. A trick to avoid the crowd – at least for a while – is stopping for an early lunch break and walk around when most people are having a bite in one of the many welcoming restaurants. Note: Warm thanks to the Costa Brava Pirineu de Girona Tourism Board for inviting me to discover this beautiful area of Spain. While I enjoyed the wonderful hospitality, the opinions expressed are exclusively mine. Thank you, Emme. 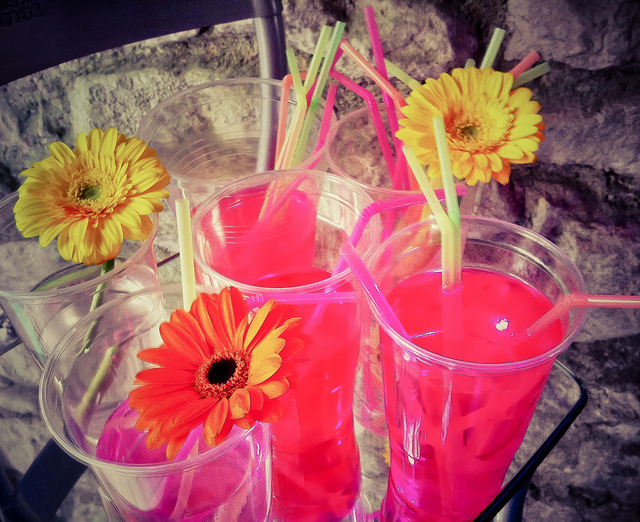 The Flower Festival in Girona is so unique and I had a great time there. Just loved how much creativity was on display. What a beautiful collection of photos!! You have such a keen eye for beauty my friend and the fragrance of spring must have been intoxicating! Now I want to go to Girona to see it all for myself! Thank you, Jeff. 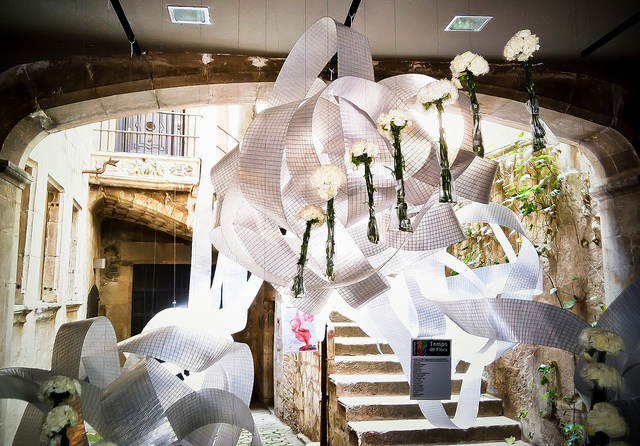 Temps de Flors in one of the most beautiful Festivals I’ve seen and I bet you’d fall in love with Girona. What a beautiful time of year and delicious photos! Thank you Simon. 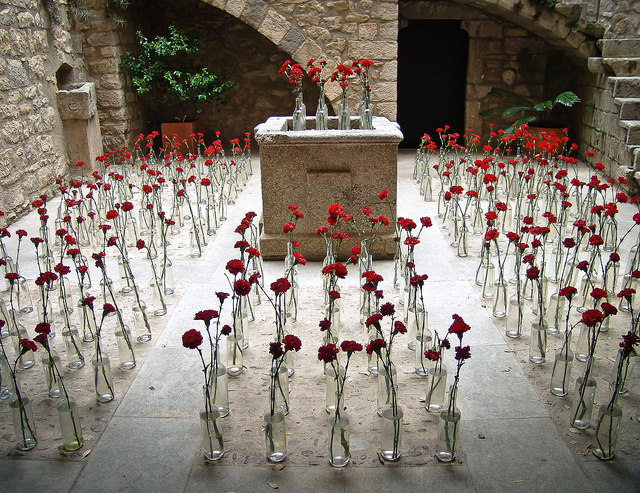 Not only would I love to visit Girona, but I would also love to see this time of the year. What a lovely way for people to express creativity and to add a unique aesthetic to the city. I love flower shows and made the trip one year to see the Chelsea Garden Show. 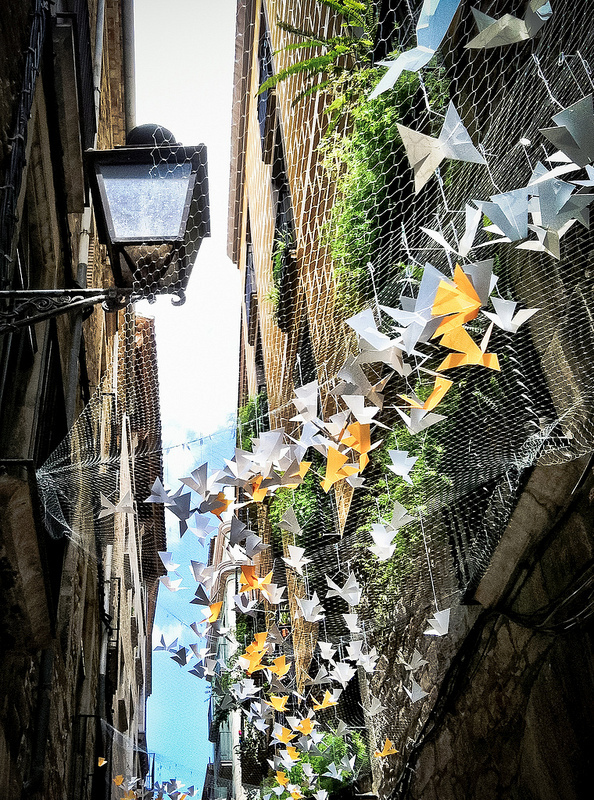 There are a lot of very creative people in Girona – and this is one show I’d LOVE to see. I’m sure you would love it, Leigh. And the city is so pretty! Gorgeous! One of my tricks when visiting these kinds of festivals is to arrive as early as possible and avoid the crowds. Thankfully, I’m a morning person. Good tip, Nancie. I also like strolling around early in the morning, especially in late Spring and Summer. It’s cooler, less crowded and the light is so much nicer. Yes, Girona is really lovely. I look forward to reading your views on the city. Girona is a sweet city – so much more relaxed and walkable than Barcelona. I’ve been meaning to do a post about all the wonderful stone stairways there. Love the cathedral flower shot.